For the gallery in Liverpool, see Walker Art Gallery. The Walker Art Center is a multidisciplinary contemporary art center in the Lowry Hill neighborhood of Minneapolis, Minnesota, United States. The Walker is one of the most-visited modern and contemporary art museums in the United States and, together with the adjacent Minneapolis Sculpture Garden and the Cowles Conservatory, it has an annual attendance of around 700,000 visitors. The museum's permanent collection includes over 13,000 modern and contemporary art pieces including books, costumes, drawings, media works, paintings, photography, prints, and sculpture. The Walker Art Center began 1879 as a personal art gallery in the home of lumber baron Thomas Barlow Walker. Walker formally established his collection as the Walker Art Gallery in 1927. With the support of the Federal Art Project of the Works Progress Administration, the Walker Art Gallery became the Walker Art Center in January 1940. The Walker celebrated its 75th anniversary as a public art center in 2015. The Walker's new building, designed by Edward Larrabee Barnes and opened in May 1971, saw a major expansion in 2005. Swiss architects Herzog & de Meuron's addition included an additional gallery space, a theater, restaurant, shop, and special events space. The visual arts program has been a part of the Walker Art Center since its founding. The program includes an ongoing cycle of exhibitions in the galleries as well as a permanent collection of acquired, donated, and commissioned works. Since the 1960s, the Visual Arts program has commissioned works from artists to exhibit and held residencies for artists including Robert Irwin, Glenn Ligon, Barry McGee, Catherine Opie, Lorna Simpson, and Nari Ward. Franz Marc, Die grossen blauen Pferde (The Large Blue Horses) This painting has been removed from the exhibit and there are no current plans to display it. Live performance art is a major part of the Walker's programming and it is seen as a leader in exhibiting the medium. In 1940, the Walker began presenting local dance, poetry, and concerts, largely organized by volunteers. By 1963, this group had become Center Opera, the Walker's performing arts program focused on exhibiting new works emphasizing visual design. In 1970, Center Opera disbanded from the Walker and became Minnesota Opera. The same year, Performing Arts was officially designated as a department of the Walker Art Center. Since the 1960s, Performing Arts at the Walker has commissioned 265 performance works. In addition, the department programs a 25-show season every year that includes performances ranging from performance art, theater, dance, spoken word and music. It is one of the largest performing arts programs of its kind found in a museum in the nation. A number of artists have long histories working with and performing at the Walker, most notably choreographers Bill T. Jones, Meredith Monk, and Merce Cunningham, for whom the Walker staged the retrospective Life Performs Art in 1998. As a longtime associate of the Merce Cunning ham Dance Company, the Walker was able to acquire 150 art objects central to the company's history from the Cunningham Foundation in 2011. The agreement included sculptures, sets, costumes and other works by artists like Robert Rauschenberg and Jasper Johns. The Walker Art Center's film and video programs feature both contemporary and historical works. In the 1940s, the Walker identified moving images (mostly movies, but also experimental films) as integral to contemporary life. Artists of that time were experimenting with film's formal properties, such as light, motion, and sound, while also separating film art from conventional narrative cinema. In 1973, the Film/Video Department was officially formed and the Edmond R. Ruben Film and Video Study Collection was established, along with an endowment to fund the development of the archive. Ruben, a leading figure in film exhibition in the Upper Midwest, and his wife Evelyn believed in collecting films as a way of preserving the art form. Today, with more than eight hundred fifty titles, the Ruben Collection brings together classic and contemporary cinema as well as documentaries, avant-garde films, and video works by artists. It holds works by visual artists that range from Salvador Dalí, Marcel Duchamp, and Fernand Léger to extensive contemporary work by William Klein, Derek Jarman, Bruce Conner, Marcel Broodthaers, Matthew Barney, Nam June Paik, Wolf Vostell, and experimental artists such as Paul Sharits and Stan Brakhage. The Walker Art Center maintains a professional, in-house design and editorial department to fulfill its various communication needs. The department is responsible for the design and editing of all printed materials, including the creation and planning of publications such as exhibition catalogues, bi-monthly magazines, and books, as well as exhibition and event graphics, signage programs, and promotional campaigns. Additionally, the department organizes design-related projects and programs, such as lectures, exhibitions, and special commissions. Over the course of its 60-plus year history, the department has organized many important exhibitions on architecture and design, and has served as a vital forum for contemporary design issues, bringing hundreds of world-renowned architects, designers, and critics to the Twin Cities through programs such as the Insights design lecture series, which celebrated its 30th year in 2016. During the 1940s, the Walker built two "idea houses" exhibiting the latest in building materials, furnishings and architectural design trends. From the late 1960s until the early '90s, the museum's design curator Mildred Friedman helped conceive and stage exhibitions on, among other topics, the Dutch avant-garde movement De Stijl, the design process at the Modernist furniture company Herman Miller, the history of graphic design, and traditional and contemporary Japanese arts, crafts and culture. For more than 30 years, the Walker has also offered the Mildred S. Friedman Design Fellowship, a yearlong program for young designers. The Walker's New Media Initiatives group (renamed Digital Media in 2017) oversees mnartists.org, an online database of Minnesota artists and organizations that provides a digital gathering place for the local arts community. Through a partnership with the Minneapolis Institute of Art, the Walker manages ArtsConnectEd, an online resource for arts educators that draws from both institutions' permanent collection resources. In 1998, the Walker acquired äda'web, an early net art website curated by Benjamin Weil and designed by Vivian Selbo. The first official project of äda'web went up in May 1995, although it had been informally active since February of the same year. In 2011, the Walker website was relaunched as a newsstyle website that features essays, interviews, and videos by both Walker staff and guest writers, as well as curated news links about global art and culture. The relaunch was met with positive reviews around the art world. Learning is emphasized as a core experience at the Walker through a mix of education programs, community building efforts, and interpretive projects. The department conducts community, family, interpretive, public, school, teen, and tour programs, as well as mnartists.org. Each division offers programs and activities in visual art, performing arts, film/video, new media, design, and architecture. To inform these undertakings, the staff work with Walker curators and partners from local organizations, artists, schools, and community groups. Advisory groups such as the Walker Art Center Teen Arts Council, Tour Guide Council, and the Parent Advisory Group are also implemented in the department for the Walker to further build relationships with its audience. The Walker's long history of publishing includes the production of exhibition catalogues, books, and periodicals as well as digital publishing. From 1946 to 1954, it published the Everyday Art Quarterly; in 1954, the publication changed its name to Design Quarterly and "shifted its emphasis away from consuming design to understanding design's impact on society and its processes and methods of practice and inquiry." It was discontinued in 1993. The Walker's in-house design studio has created countless exhibition catalogues dedicated to the art of Marcel Broodthaers, Trisha Brown, Huang Yong Ping, Kiki Smith, Kara Walker, Andy Warhol, and Krzysztof Wodiczko, among many others, as well as books on design, architecture, social practice, and other topics in contemporary art. In 2011, the Walker redesigned its homepage as an "idea hub," a news-magazine format that presents original interviews, videos, commissioned essays, scholarly writings, and newslinks. The publishing-forward homepage was hailed as a "game-changer, the website that every art museum will have to consider from this point forward" (Tyler Green, Modern Art Notes) and "a model for other institutions of all kinds" (Alexis Madrigal, The Atlantic). The site won Best of the Web awards at the 2012 Museums and the Web conference, including "Best Overall Site" and "Best Innovative/Experimental Site." It also won a gold MUSE Award for "Online Presence, Media & Technology" from the American Alliance of Museums. In 2017, the homepage was redesigned, and the Walker's digital publishing was rebranded under the title Walker Reader, a magazine landing page that aggregates original content from the Walker's five verticals. Located on a 17-acre urban campus, the Walker Art Center's 260,000 square foot, 8-story building encompasses 10 art galleries along with a cinema, theater, shop, restaurant, and café, along with other special events spaces and lecture rooms. The original building was designed by New York-based architect Edward Larrabee Barnes and opened in May 1971. Barnes designed the building in the minimalist style of the period with a plain, modular brick exterior and expansive white spaces in the interior. The structure is a unique arrangement of galleries that spiral up around a central staircase and open onto rooftop terraces. The Walker's architecture gained critical acclaim upon its opening and Barnes was awarded the American Institute of Architects Award for his work. In 2005, Barnes' original building underwent a $67 million expansion designed by Swiss architects Jacques Herzog and Pierre de Meuron. The addition was built on a "town square" concept meant to open up Barnes' boxlike building through accessible gathering spaces. Its central element is an abstract geometric tower made of aluminum mesh panels, built for Herzog & de Meuron by the Minnesota firm Spantek, and glass windows that holds the theater, restaurant, and shop spaces. Windowed halls containing expanded gallery and atrium spaces connect the tower to the original structure. In the summer of 2015, the Walker announced a plan to unify the Walker and the surrounding Minneapolis Sculpture Garden. Key features of the renovation include a new entry pavilion for the Walker, a new hillside green space, the Upper Garden, and the reconstruction of the 26-year-old Minneapolis Sculpture Garden, a partnership with the Minneapolis Park and Recreation Board. The project also implements green-roof technology, rainwater reclamation systems in the Garden, and the addition of hundreds of new trees throughout the campus. The Walker renovation was completed in November 2016, with the Garden reopening to the public in spring 2017. The Walker Art Center began with Minneapolis businessman Thomas Barlow Walker, who held one of the largest private art collections in the region. In 1879, he dedicated part of his home to exhibiting the art to the public for free. In 1916, Walker purchased the land now known as Lowry Hill to build a museum for his growing collection. His museum, the Walker Art Galleries, was opened on May 21, 1927. In 1939, the Minnesota Arts Council was granted control of the building on Lowry Hill, along with its art collection, in order to create a civic art center. With the assistance of the Works Progress Administration, building improvements were made and the Walker Art Center opened in January 1940. Daniel Defenbacher, who led the Federal Art Project's Community Art Center program, left the WPA to become the first director of the Walker Art Center. Around this time, the Walker officially began its focus on modern and contemporary works of art. The Walker's current building designed by Edward Larrabee Barnes was opened in 1971 and expanded in 1984. Minneapolis Parks and Recreation partnered with the Walker Art Center to establish the Minneapolis Sculpture Garden on the Walker's campus in 1988. Opened in April 2005, the most recent building expansion nearly doubled the size of the Walker Art Center. The expansion, designed by Herzog & de Meuron, included an additional gallery space, a theater, restaurant, shop, and special events space. In June 2017, the opening of the gallery's art garden was delayed due to protests over Sam Durant's sculpture Scaffold. 1927 – Walker Art Galleries opens in Minneapolis, on the current Walker Art Center site. 1940 – Funded by 1939 Works Projects Administration (WPA) grants, Walker Art Galleries becomes the Walker Art Center. Under its first Director, Daniel Defenbacher, it began to add modern and regional art to the eclectic collection gathered by T. B. Walker. It opens to the public with exhibitions Ways to Art, Parallels in Art, and Trends in Contemporary Art, signaling its new interest in Modern Art. Defenbacher and his wife Louise Walker Defenbacher collaborated on Design Quarterly, which showcased good modern design in housewares and furniture. Spring Dance Festival, organized by Gertrude Lippincott, is the first performance event at the Walker. 1942 – Franz Marc, Die grossen blauen Pferde (The Large Blue Horses) (1911) is the Walker's first acquisition of Modern Art. 1946 – Everyday Art Gallery, curated by Hilde Reiss, opens as the first exhibition space dedicated for design in a U.S. museum. Everyday Art Quarterly (later renamed Design Quarterly) begins publication as the first U.S. museum journal on design. 1948 – Edward Hopper, Office at Night (1940) acquired. 1950 – Walker art school closed. Defenbacher replaced as Director by H. Harvard Arnason. 1954 – Georgia O'Keeffe, Lake George Barns (1926) is acquired. 1963 – Walker Art Center establishes the Center Opera Company, which later becomes the Minnesota Opera. Guthrie Theater opens adjacent to the Walker. John Cage, with the Merce Cunningham Dance Company, presents first Walker performance. 1964 – Dominick Argento's Masque of Angels performed by the Center Opera Company as first Performing Arts commission. 1967 – Andy Warhol 16 Jackies (1964) acquired. 1970 – Performing Arts Department is formed. 1971 – New Walker Art Center opens, designed by Edward Larrabee Barnes. 1972 – Film/Video Department is established. 1976 – The Walker becomes a public institution; T.B. Walker Foundation establishes museum endowment. 1978 – Laurie Anderson performs as part of the Perspectives series, copresented with the Saint Paul Chamber Orchestra. Summer Music & Movies in Loring Park begins. 1989 – Out There series of experimental performance art and theater begins. 1990 – Regis Dialogues, a series of film retrospectives and interviews with noted filmmakers and actors, begins with Clint Eastwood and James Ivory. 1992 – Minneapolis Sculpture Garden expansion opens. 1996 – New Media Initiatives Department is formed with Gallery 9, a web site for net art, launches with Piotr Szyhalski, Ding an sich (The Canon Series) (1997), the first new-media commission. 1998 – Charles Ray, Unpainted Sculpture (1997) acquired. Art Performs Life: Merce Cunningham/Meredith Monk/Bill T. Jones, a multidisciplinary exhibition, celebrates the Walker's long-term relationships with the artists. ArtsConnectEd, a web site featuring the collections of the Walker and the Minneapolis Institute of Art, launches. 2002 – mnartists.org, a joint project of the Walker and the McKnight Foundation, launches. 2005 – Newly expanded Walker Art Center, designed by Herzog & de Meuron, opens in April. The Walker Art Center is supported in part by a grant provided by the Minnesota State Arts Board through an appropriation by the Minnesota Legislature from the State's general fund and its arts and cultural heritage fund. 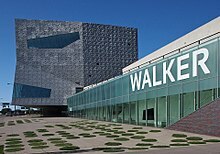 To ensure the Walker's creative independence, then-director Kathy Halbreich forswore millions of dollars in potential state aid for the museum's $73.8 million expansion in 2005, a decision that resulted in a one-year salary freeze, some staff cuts, and the elimination of the Walker's new-media art program. In 2011, the Walker Art Center reported net assets of $243 million. Its annual expenses were $22 million, and its endowment was at $152 million. The museum director's compensation is at around $375,000. As of 2011, total attendance was at about 590,000 visitors, out of which 22% were Teen and Youth Visitors. ^ Abbe, Mary (2015-11-30). "Walker Art Center: 75th anniversary a 'banner year' with strong attendance, art gifts". Star Tribune. Avista Capital Partners. Retrieved 2016-04-14. ^ a b Huber, Molly. "Walker, Thomas Barlow (T.B. ), (1840–1928)", Minnesota Historical Society, 08 July 2015. Retrieved on 14 April 2015. ^ a b Rash, John (January 30, 2015). "The Walker's WPA roots are still relevant today". Star Tribune. Minneapolis, Minnesota. Retrieved 2015-06-21. ^ "Walker Art Center Marks 75th Anniversary with Major Institutional Advancements Including Campus Renovation, New Staff Appointments, and Expanded Cross-Disciplinary Programming". Walker Art Center. March 31, 2015. Retrieved 2015-06-20. ^ a b Ouroussoff, Nicolai. "An Expansion Gives New Life to an Old Box", The New York Times, Minneapolis, 15 April 2005. Retrieved on 14 April 2016. ^ Abbe, Mary. "Walker Art Center throws itself a 75th anniversary party", Star Tribune, 16 October 2014. Retrieved on 26 April 2015. ^ La Rocco, Claudia. "Museum Shows With Moving Parts", The New York Times, 31 August 2012. Retrieved on 5 May 2016. ^ "History", Minnesota Opera, 2016. Retrieved on 5 May 2016. ^ Sheets, Hilarie. "When the Art Isn’t on the Walls: Dance Finds a Home in Museums", The New York Times, 22 January 2015. Retrieved on 5 May 2016. ^ Royce, Graydon. "Philip Bither: Getting 'Out There' with the ultimate insider", The Star Tribune, 8 January 2015. Retrieved on 5 May 2016. ^ Weber, Bruce. "ARTS IN AMERICA; Taking a Long View Of Temporal Dance", The New York Times, 5 August 1998. Retrieved on 5 May 2016. ^ Kennedy, Randy. "From the Backdrop to Their Own Stage", The New York Times, 16 March 2011. Retrieved on 5 May 2016. ^ Nelson, Ryan Gerald (2016-02-10). "Insights 2016 Design Lecture Series". Walkerart.org. Retrieved 2016-03-30. ^ "The Walker Idea Houses". Hennepin County Library Tumblr. ^ William Yardley (September 9, 2014), Mildred Friedman, 85, Dies; Curator Elevated Design and Architecture New York Times. ^ Dietz, Steve (2005). "äda'web." In Bits & Pieces Put Together to Present a Semblance of a Whole: Walker Art Center Collections, edited by Joan Rothfuss and Elizabeth Carpenter. Minneapolis: Walker Art Center. Retrieved 1 June 2016. ^ Weil, Benjamin. "A Brief History of Äda'web". Walkerart.org. ^ "Design Quarterly". Walker Art Center. Retrieved June 20, 2018. ^ Blauvelt, Andrew (October 10, 2014). ""A Timeline of Design History"". Walker Art Center. Retrieved June 20, 2018. ^ "Design Studio". Walker Art Center. Retrieved June 20, 2018. ^ Schmelzer, Paul (December 5, 2011). """Gamechanger": Early Reviews of the New Walker Website"". Walker Art Center. Retrieved June 20, 2018. ^ Madrigal, Alexis (December 5, 2011). ""Museum as Node: What to Love About the Walker Art Center's New Website"". The Atlantic. Retrieved June 20, 2018. ^ ""Best of the Web Winners"". Museums and the Web. Retrieved June 20, 2018. ^ ""2012 MUSE Award Winners"". American Alliance of Museums. Retrieved June 20, 2018. ^ "Walker Reader". Walker Art Center. Retrieved June 20, 2018. ^ Baluvelt, Andrew. "Edward Larrabee Barnes", Walker Art Center, 1 April 2005. Retrieved on 21 April 2016. ^ Boniface, Russell. http://info.aia.org/aiarchitect/thisweek06/1208/1208n_gold.htm "Edward Larrabee Barnes, FAIA, Selected for 2007 AIA Gold Medal"], American Institute of Architects, 2007. Retrieved on 21 April 2016. ^ Caniglia, Julie. "From the Archives: 1971 and 'everything that is farthest out on the current art scene'", Walker Art Center, 23 December 2011. Retrieved on 21 April 2016. ^ Herzog & de Meuron. "Walker Art Center, Expansion", Herzog & de Meuron, 2001. Retrieved on 21 April 2016. ^ "Walker Art Center". Spantek/ UMI Company, Inc. Retrieved December 8, 2018. ^ Ryan, Raymund. "Herzog & de Meuron. The Walker Art Center", Domus, 11 May 2005. Retrieved on 21 April 2016. ^ "Administration of the State WPA/FAP: Minnesota, [Walker Art Center] 1940". Archives of American Art. Smithsonian Institution. Retrieved 2015-06-21. ^ Bina, Lauren. "Minneapolis Sculpture Garden: 1988 Opening Day", Walker Art Center, 16 July 2015. Retrieved on 14 April 2016. ^ Ouroussoff, Nicolai (April 15, 2005). "An Expansion Gives New Life to an Old Box". The New York Times. ^ Eckardt, Stephanie (June 1, 2017). "Here's One Way to Deal with Problematic Artworks, Like Sam Durant's Scaffold: Burn Them". W.
^ "Oral history interview with H. Harvard Arnason, 1970 Mar. 3–9". Oral history interviews. Archives of American Art. 2011. Retrieved 17 Jun 2011. ^ "Walker Art Center Timeline" (PDF). Walker Art Center Minneapolis Sculpture Garden. ^ "Support - Walker Art Center". Walkerart.org. Retrieved 2014-01-26. ^ Carol Vogel (March 20, 2007), Influential Director Resigns at Minneapolis Art Center New York Times. ^ Shane Ferro (July 25, 2012), As MOCA's Money Woes Simmer, A Look at How Major Museums' Finances Work ARTINFO. ^ "2010-2011 Walker Art Center Annual Report". Walkerart.org. Retrieved 2014-01-26. ^ Defenbacher, D. S. (Daniel S.), 1906-1986 Social Networks and Archival Context. ^ Brian Boucher(May 10, 2016), Longtime Walker Art Center Director Martin Friedman Dies at 90 Artnet News. ^ Mary Abbe (May 11, 2016), Martin Friedman, former Walker Art Center director, dies at 90 Star Tribune. ^ Grace Glueck (November 10, 1990), A Museum Chief Greets the Fray New York Times. ^ Carol Vogel (September 12, 2007), Hirshhorn Director to Head the Walker in Minneapolis New York Times. ^ Pogrebin, Robin (2018-11-13). "Walker in Minneapolis Raids Long Island City for New Director". The New York Times. ISSN 0362-4331. Retrieved 2019-02-25. Wikimedia Commons has media related to Walker Art Center.